O funk metal (também conhecido como thrash funk, funkcore ou punk-funk) é um subgênero do funk rock e do metal alternativo que mescla técnicas sonoras e riffs característicos do metal e do funk. Caracteriza-se pelo uso de riffs bastante pesados típicos do heavy metal: o baixista toca ritmos característicos de funk (incorporando a técnica do slap, às vezes ritmos do rock alternativo. Os compositores se aproximam de rimas "estilo-hip hop". O site Allmusic descreveu que o "funk metal evoluiu em meados dos anos 80, quando bandas de rock alternativo como Red Hot Chili Peppers e Fishbone começaram a mesclar funk com heavy metal". Faith no More é descrito como uma banda de funk metal que teve "interesse" pelo rap metal. Rage Against the Machine além de mesclar o funk, metal e rap, também trouxe elementos do punk rock. Primus, uma banda que nunca teve um gênero definido, tem sido referido como "thrash metal - que conheceu Don Knotts". Living Colour foi citado pela revista Rolling Stone como "pioneiros do black-funk-metal". Faith No More misturando funk metal com metal alternativo e rock experimental. 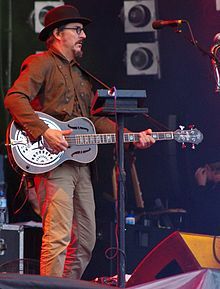 Les Claypool, vocalista da banda de funk metal Primus. Algumas bandas que não são da "cena underground", como o Bang Tango e Extreme, frequentemente incorporam características do funk metal em seu estilo musical. ↑ a b c d e f g h i j Funk Metal . Retrieved February 1, 2012. ↑ Rap-Metal . Retrieved February 1, 2012. ↑ a b The Battle of Los Angeles : Rolling Stone. November 1, 2003. Archived from the original on April 14, 2010. Retrieved February 1, 2012. ↑ Gore, Joe (August 1991). New Rage: The Funky from Guitar Player. Retrieved February 1, 2012. ↑ a b Fricke, David (November 13, 2003). Living Colour: Collideoscope : Music Reviews : Rolling Stone. Archived from the original on April 12, 2009. Retrieved February 1, 2012. ↑ a b Prato, Greg. Bango Tango > Overview . Retrieved February 3, 2012. ↑ a b Erlewine, Stephen Thomas. Extreme > Biography . Retrieved February 3, 2012. ↑ Prato, Greg. 24-7 Spyz > Overview . Retrieved February 3, 2012. ↑ Bush, John. Clutch > Biography . Retrieved February 4, 2012. ↑ Rivadavia, Eduardo. Electric Boys > Overview . Retrieved February 1, 2012. ↑ Hurt Smile no Myspace. Retrieved February 1, 2012. ↑ Huey, Steve. Incubus > Biography . Retrieved February 1, 2012. ↑ Book, John. Infectious Grooves > Overview . Retrieved February 1, 2012. ↑ Erlewine, Stephen Thomas. Devil Without a Cause > Review . Retrieved February 3, 2012. ↑ a b c Torreano, Bradley. Allmusic ((( L.A.P.D. > Overview ))). Retrieved February 1, 2012. ↑ Rivadavia, Eduardo. Mind Funk > Overview . Retrieved February 1, 2012. ↑ Prato, Greg. Suicidal Tendences > Biography . Retrieved February 1, 2012. ↑ Anderson, Rick. Persona Non Grata > Overview . Retrieved February 3, 2012.